Well, if you don’t have an iPhone, you don’t have an iPhone. You can still have it, but only after a few days. The first batch of 55,000 iPhone 6 and iPhone 6Plus units shipped to India are sold out. Prospective buyers will now have to wait for a minimum of three days before the stocks are replenished. Sources at Apple India confirmed that three of the four authorised distributors had run out of the iPhones 6 series, which was launched in the country on October 16 midnight. The premium smartphone is sold through Redington, Ingram Micro, Rashi Peripherals and Reliance. The entire 55,000-unit batch was sold within 72 hours. Apple plans to ship another 25,000 units in the next few days. “We take a few days for the iPhones to be brought here, a minimum of three days for new stock,” said a source from Apple India. Store sources indicate that the wait may well be longer if the stocks do not reach in time. A Samsung spokesperson said the company has sold more units of its Galaxy Note 4, which was also launched on the midnight of October 16, than iPhone6 and 6Plus. Apple and Samsung are trying to cash in on the festival season in India to push their latest premium products, priced in excess of R 50,000. As snowstorms lashed Nepal’s Himalayan region few days ago, a five-year-old boy from New Delhi and his father stayed indoors at a small lodge in Pheriche, a village in the Everest region located 4371 meters above sea level. They were worried that the mission that they had set out to accomplish could get jeopardized midway. But the weather cleared two days later and they set out again towards their goal. On Friday, Harshit Saumitra, a Class 1 student of GD Goenka School in New Delhi, reached the Everest Base Camp (5364 m), becoming arguably the youngest person to complete the difficult trek. It took the child 10 days to cover the distance of 62km trek, many sections of which were covered by 5-7 inch of snow from the snowstorm caused by the tail-end of cyclone Hudhud. “I felt very good. I unfurled the tricolor at the Everest Base Camp,” said Harshit at a press meet here after his return from the trek. 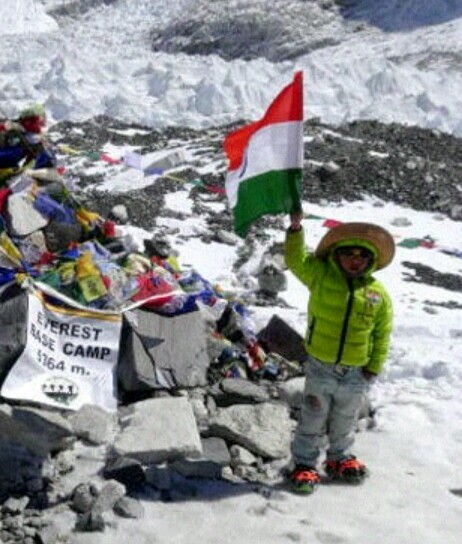 He also climbed the Kalapathar (5550 m) peak located near the EBC.With this feat the child overtakes the record set by Aaryan Balaji, a seven-year old Indian boy who had reached EBC and Kalapathar peak in May 2012. “We were worried that Harshit might experience altitude sickness. But he didn’t face any problem,” said the child’s father Rajeev Saumitra, a mountaineer who had reached the peak of Mount Everest (8848 m) last year. The family plans to register the feat in record books like the Guinness World Records and the Limca Book of World Records by submitting the necessary proofs. Harshit who climbed Rohtang Pass (3930 m) before attempting EBC has his eyes set on climbing Mount Kilimanjaro (5895 m) in Africa next and plans to attempt Mount Everest (8848 m) in a few years.